I’ve been struggling to sleep recently, for various reasons, one of them being a bad back. A few years ago, in an effort to minimise back discomfort at night, we treated ourselves to a lovely new mattress. It was money well spent, because generally, the firmer support from this mattress help support my sore back during the night. When it’s really bad, there’s not a lot that helps, apart from intensive chiropractic treatment. Anyway, I digress. Today, I’m thrilled to be offering one lucky reader, the chance to win this fabulous Memory Foam double mattress with real Aloe Vera, worth a whopping £629. The lovely people at Dormeo are working with me and have donated this great prize. Here are some images, but you can look at the mattress in more detail on their website, here. 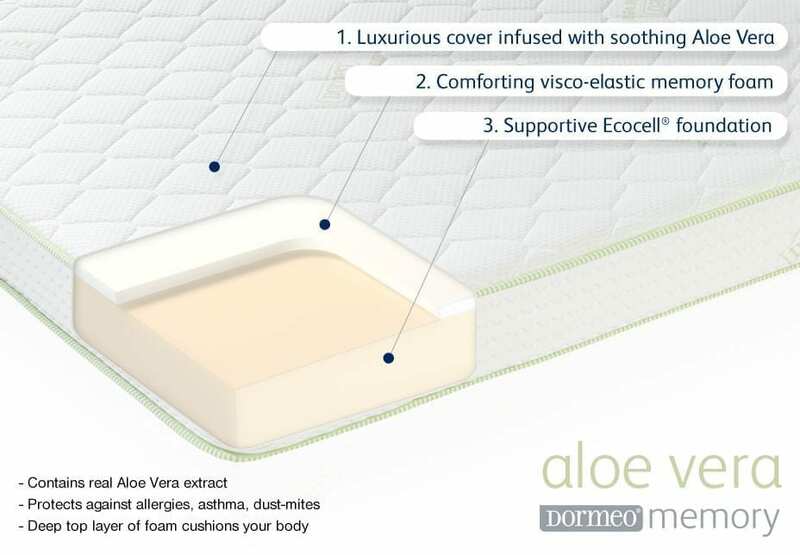 The Dormeo Aloe Vera mattress is one of the newest additions to the Dormeo Memory range. A special Aloe Vera extract has been added to the cover to enhance the softness bringing comfort, relaxation and peace of mind. It contains 40mm of highest quality Dormeo visco-elastic memory foam sewn directly into the plush, comforting cover, giving you the most comfortable night’s sleep imaginable. This soft memory foam comfort cradles, accepts and supports your body, reducing tossing and turning, improving blood circulation and aiding muscle regeneration while you sleep. Supporting the comforting upper layer is 140mm of supportive Ecocell® foam – the Dormeo difference. Ecocell® is a patented 3D open cell foam, designed to work in perfect unison with Dormeo memory foam. The Ecocell® provides excellent support for your body, keeping your spine in perfect alignment, crucial for a healthy, rejuvenating sleep. The prize is a Dormeo Memory Foam Double Mattress with Aloe Vera worth £629. There is no cash alternative. Entrants can also follow Love Chic Living on Twitter, follow Dormeo on Twitter and follow Dormeo on Facebook for extra entries. Individual comments must be left for all additional entries. All the requirements of the competition have been met. Followed @lovechicliving, tweeted (@gedge72) and subscribed to newsletter. Yes, I’ve tweeted and followed, and subscribed! Tweeted, I’m in !. Fingers crossed. I have tweeted as @SallyPalmer6, followed the other sites and joined the newsletter. Completed all requirements including extra entries. following @lovechicliving @DormeoUK on Twitter as @Kra1kee I have also tweeted. I’ve tweeted (@marieemonaghan). Thanks for the giveaway! I’ve also subscribed to the newsletter. Liked on facebook as Caroline Spring Clarke. I have tweeted as @pinkchic45 and subcribed to news letter. Tweeted (@BennyWilliams13). Could really do with one of these. Will beat my futon mattress. I’m following you on twitter, @happyhikerhilda. I’ve liked the DormeoUK facebook page! Follow @lovechicliving/@dormeouk on Twitter, tweet URL https://twitter.com/Elsbellsblue/status/477376484684742656 & signed up by email. Fabulous giveaway. I’ve subscribed to the newsletter. Thanks for the competition! I follow Dormeo on Facebook as Ali Thorpe. I follow Dormeo on Twitter as @alicomps. I am subscribed to your newsletter too. Following all on Twitter and sent the tweet – fabulous prize! Done it. Tweeted, followed, signed up – everything! All done – tweeted and followed. Following Love Chic Living on Twitter @spiritguide1 & I follow Dormeo on Twitter and follow Dormeo on Facebook, Great Prize thanks. Tweeted message and followed as @Shank911Gagan. Have subscribed via email too! I have tweeted the message – my Twitter username is @Loreleigh. I’ve been wanting to change my mattress for well over a year now as my back pain is worsening so, along with all the other entrants, I will be keeping my fingers crossed hoping for a little bit of luck to come my way – it would be wonderful to get a good night’s comfortable sleep on a regular basis. I am now following @lovechicliving on Twitter. Fingers well and truly crossed on this one. I am following @dormeouk on facebook. Tweeted the message – thanks! Also following both on twitter. And liked page on fb. Makes me want to go to sleep now! I’ve liked the Dormeo facebook page! Would so love one of these for my back. Great prize, I have tweeted and I am already following you on twitter (@writerkms). I also like the Dormeo facebook page. Thanks for a super prize. Four steps to a good night’s sleep ……………..
I’ve signed up tom the newsletter. Many thanks for the chance to win this amazing prize! Have subscribed to your newsletter! I have tweeted, followed and liked. Posted on twitter https://twitter.com/MrOlly1/status/484083016013074432 Followed all on Twitter and Facebook and subscribed. I am following lovechicliving on twitter. I’ve tweeted and followed the three accounts. Thanks. thank you to you both for such an amazing opportunity this would certainly be a dream in more than one way for me. I’m following @lovechicliving on Twitter. I’m following @dormeouk on Twitter.